Wait a minute, these are actually magnificent results! Look at the 'early' Maykop results and the 'late' Maykop results! Late Maykop is clustered with Copper Age Iranians. So there was a migration of Copper Age Iranian into Maykop! There was a migration of Leyla-Tepe people into Maykop between 'early' Maykop and 'late' Maykop! The steppes model has been DESTROYED one more time. That's the kind of crazy I like. YES, baby, YESSSSSSSSSS! I'm almost crying right now! Middle Eastern auDNA in Yamnaya comes from Maykop, PERIOD! It feels like VICOTRY. It is a VICTORY day for Tamaz V. Gamkrelidze & Vyacheslav Ivanov. Last edited by ms85; 05-16-2018 at 10:15 PM. because I often read how Armenians are ''no real Caucasians'' while this states that it is rather north Caucasians who recieved more recent external admixture. Aryanisation of the Caucasus started actually very late. Ancient Aryan people, like modern Western Iranian people migrated into the Caucasus and Arianised it pretty late. Accordigng to some Georgian legends, Georgian people came from Iran. But ALL those migrations came much later than Maykop. So if I'm reading this right they're detecting minor CHG in Khvalynsk, essentially. 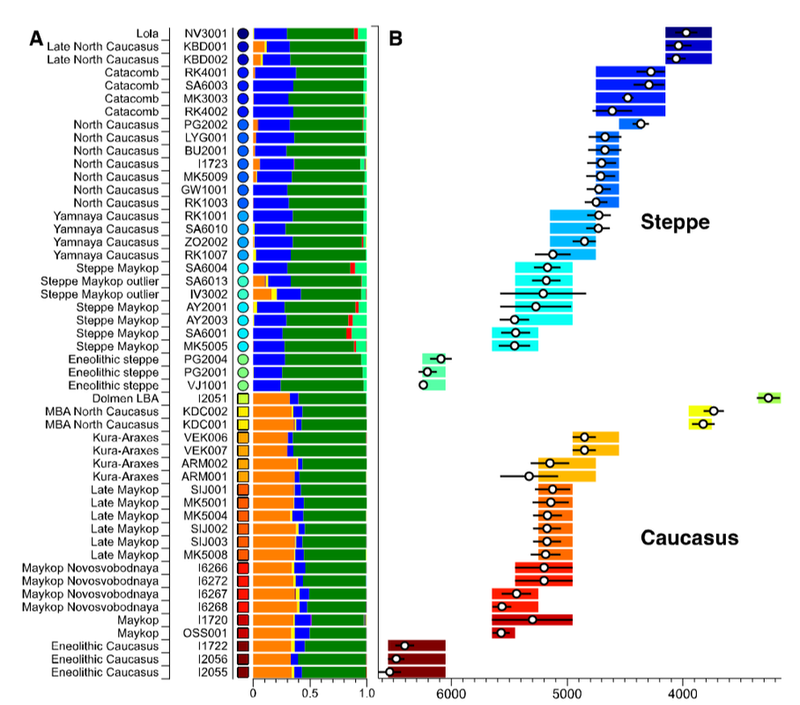 However, we could successfully model Steppe Maykop ancestry as being derived from populations related to all three sources (p-value 0.371 for rank 2): Eneolithic steppe (63.5±2.9 %), AG3 (29.6±3.4%) and Kennewick (6.9±1.0%). We note that the Kennewick related signal is most likely driven by the East Eurasian part of Native American ancestry as the f4-statistics 276 (Steppe_Maykop, Fitted Steppe_Maykop; Outgroup1, Outgroup2) show that the Steppe Maykop individuals share more alleles not only with Karitiana but also with 278 Han Chinese when compared with the fitted ones using Eneolithic steppe and AG3 as two sources and Mbuti, Karitiana and Han as outgroups (Supplementary Table 2). - Immediate post-LGM (15,000-10,000 BP) Mesolithic Europe was nearly all a WHG dominion--from Spain through European Russia-- following the displacement of Goyet/Vestonice Ice Age types. 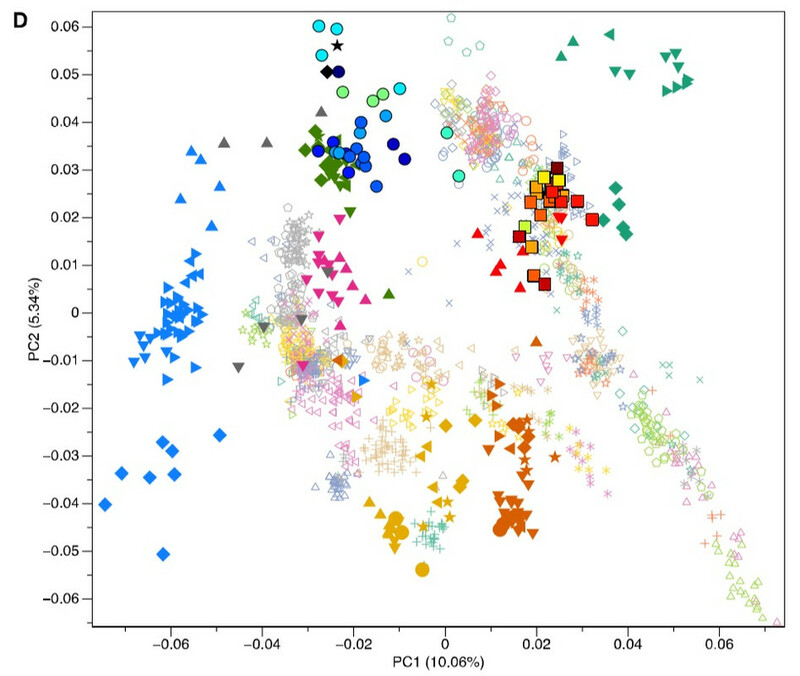 - MA1/AG3 arrives from the east in Late Mesolithic/Early Neolithic (10,000-8,000 BP) not only to Europe (creating the WHG-EHG cline-- note how Latvian Mesolithic hunter gatherers were almost fully WHG-like while MN samples from the same region were EHG-like), but ALSO to the edge of the North Caucusus (creating a CHG-ANE cline). - Khvalynsk types bring lots of EHG ancestry to the North Caucasus-grassland steppe border zone in the Eneolithic. Last edited by K33; 05-17-2018 at 04:48 AM. I know how it feels bro. I'm R1a* and there is no R1a* in Maykop either. My R1a* ancestors preferred Zagros over Mt. Elbrus!